The Tubifexling is a worm colony-based lifeform. 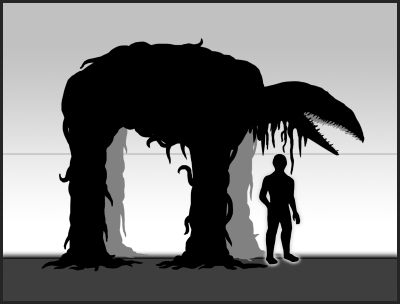 It resembles a massive quadruped creature made out of 10,000 or more blue worms. Each worm varies in size, from 1 inch to 3 feet (91.44cm) in length. A large, dominant worm makes up its torso and head. It has a primary mouth with a movable jaw and a secondary mouth that's circular in shape. A clear, sticky residue coats all worms in the colony. The Tubifexling's long and muscular neck can be withdrawn inside its body, like how a turtle draws its head back into its shell. Both mouths have small, jagged teeth. When a tooth's broken, two or three more will replace it. A Tubifexling can have up to 5,600 rows of teeth. The Borderling has a hollow, expandable stomach, which it can store its colony inside. It has a moist, earthy odor. The Tubifexling speaks in an airy, raspy voice like it has a bad respiratory infection. Incoherent words can be heard from it, even though the Borderling's not sentient. An impure Tubifexling won't hold its shape for long. Worms can be seen falling off its body, revealing a body full of black sores. The Tubifexling can be seen in suburban alleyways with walls covered in foliage. In some cases, it can be found around neighborhood backyards, heavily shaded parks and outdoor banquet halls and dining areas. The dominant worm manifests itself into our dimension through a gaping hole on the ground, 5ft in diameter. Smaller worms are regurgitated out of its smaller mouth and assemble into its ideal quadruped shape. The Tubifexling has a dull and hungered disposition. It carelessly wanders the area it visits. It moves with slow, trudging steps while keeping its torso and head horizontally in place. Its head slowly sways from side to side. The worms that cover the dominant worm acts like one mind and one body. Sometimes it takes a leisurely break and allows its worm colony to touch and observe it's surroundings. Flowers, cans, bottles, and vines draping and emerging from walls catch the Tubifexling's interest. It picks flowers and examines the petals, one by one, before making an attempt to place it back on the plant. Vine tendrils and anything that resembles a worm will be pulled into the Borderling's body. Each time the Tubifexling takes a step, the worms relax and contract like muscle tissue. When stationary, they loosen and move freely while keeping its ghastly shape. Dirt and decaying plant matter comprises the Borderling's diet. It eats about 60 lbs each day. An impure Tubifexling will have worms that are in conflict with one another and will push out infected worms out of the colony. If the infection gets worse, the colony won’t have enough individuals to maintain its form. The main body of the Borderling will wheeze in pain while scraping its sore body on the ground. Eventually, it will succumb to a slow and painful death. Earthworms are attracted to the Tubifexling's 7ft Effect Radius. 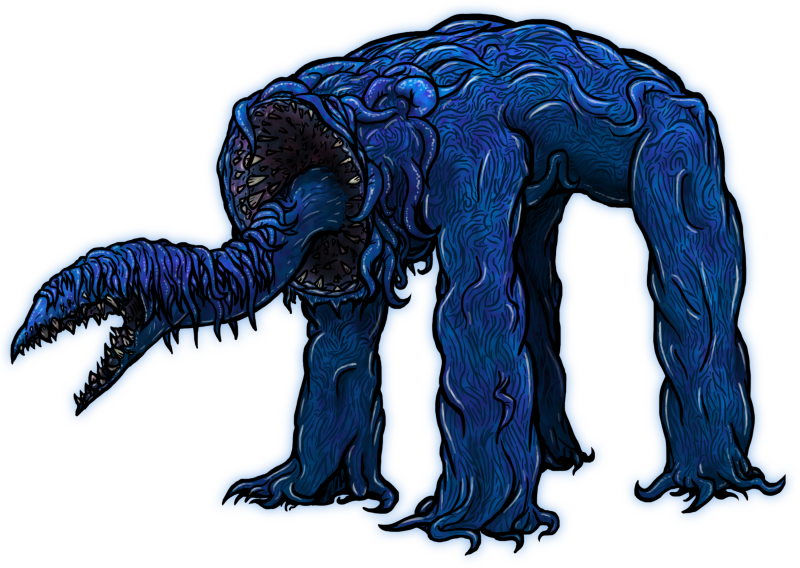 As they follow the Borderling, their bodies will begin to bulk up and turn blue. These creatures are becoming part of the Tubifexling. When the worms had caught up with the Borderling they will burrow between each worm and work in sync with the Tubifexling as a whole. spasms will twitch in the direction of the colony. An impure Tubifexling will have a weaker Effect Radius compared to its healthier counterpart. Worms and muscular tissue won't have a drastic effect and will cause a slight itching sensation.